I've been doing some cooking lately. Trying to eat out less and to have some good ole family fun. I love the family dynamics, the interactions...I love just laughing and talking with my family and that seems to happen most when we break bread together. Thus, I've been planning meals and cooking more. One of our family favorites is something that is fast and easy to put together. Don't ask for a recipe. Just pick your favorite fresh veggies, drizzle with some olive oil, season and throw in the oven (400 for about 25 min - if you add some red (or any cubed) potatoes I recommend that you cube them, and microwave for 10 min before tossing in with veggies so they are done when veggies are). 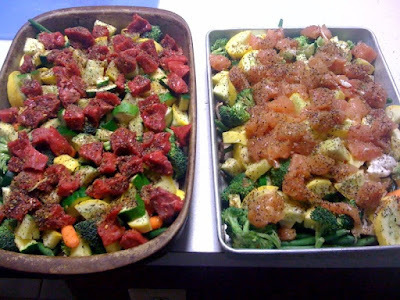 We usually do broccoli, cauliflower, zucchini, yellow squash, green beans, carrots, mushrooms and sometimes add a meat (beef cubes or chicken - or both). I also season with Mc.Cor.micks Montreal Steak Seasoning. You pick your own, this is what we like. It is absolutely delish. Also on the menu this week was Gumbo. I pulled out CreoleInDC's Simple Gumbo Recipie and opened my Good Housekeeping Cookbook (my Gma gave it to me when I got married 23 years ago - yep, I still have it and use it) and put it together TravelDiva style. Since I wanted to make this on a weeknight where we had a lot of other stuff to do, I adjusted so I could make it in my crockpot. I have found that crockpot cooking is the jack of a solutions to a busy lifestyle. It removes any excuse about either not cooking cause you don't have time (work, kids activities etc) or not exercising/spending time with friends & family/participating in an activitiy - blah, blah, blah. You see, you throw it in the pot, turn it on low, go do what ya gotta/wanna do and WHA LA! -a couple of hours later (or less) - Meal Time. For the gumbo, I started at about 4pm, took 30 min of prep time (chop to pot), walked away to a school play and other stuff and at 7pm we were having the most absolutely devine gumbo EVER!!! I ended up using two crock pots with the recipie as is. You will have to half it if you want to make it and it fit in only one LARGE crock pot. I have 3 on hand, 5 if I include my moms. Pour broth in crock pot & turn on high while you prep all the other ingredients. Heats up the broth while prepping. I added some "Island Creole Seasoning" that I had bought in St. John to the broth. Season as you like. We like spicy. Chop, cube all of your ingredients and have ready. Cover, leave on high for approximately 2 hours or chicken is cooked thru. I have to say it is even better the next day.